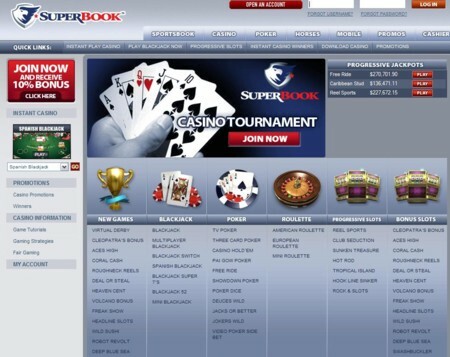 Superbook belongs to the sportsbook network of betting sites that has been in operation since 1996. It is licensed in Antigua and Barbuda. 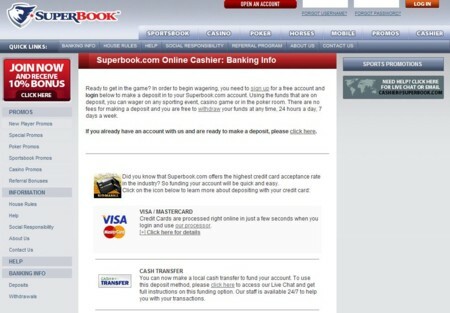 Superbook offers a number of exciting bonuses and promotions. New players are eligible for a 10% welcome bonus up to a total of $500. Existing players can earn a 5% reload bonus on every deposit that they make at the site, however the minimum deposit accepted for this bonus is $250 and the reload bonus is capped at $250. You can also earn an easy 5% extra bonus for every deposit that you make using an ewallet, such as Moneybookers or UseMyWallet. If you refer a friend to the sportsbook, you will be eligible for a 20% deposit bonus up to a total of $200. In addition, you will be in with the chance to win $1,000 as every month the casino will reward the member who has made the most referrals that month. Players can bet half juice on Fridays in select basketball games. If you have any questions when betting at Superbook you can first access the self help page which contains the answers to many general enquiries. If you do not find the answer to your question there you can contact a customer service representative 24 hours a day, seven days a week via telephone or email. They guarantee to respond to emails within 1-2 hours. Alternatively, you can contact customer service via online chat until 9pm EST every day. Players can make deposits via safe and convenient payment methods such as VISA, Master Card, NETeller, UseMyWallet, Eco Card and Moneybookers. There are a number of useful betting tools that are available at Superbook. These include new mobile betting, the ability to check your wagering history, betting trends, team statistics and top ten bets, to wager on horses and make use of a multi sport parlay card. You can also refresh your balance and check your first bet. Players can also easily see the current hot bets at the site. There are many games that players can bet on. These include NBA (NBA lines, props, Magic vs. Hawks, Lakers vs. Jazz, NBA futures, NCAA futures and parlays and teasers); baseball (MLB, props, MLB futures, regular season props and parlays and teasers); hockey (NHL lines, NHL futures, IIHF World Championships, parlay and teasers); MMA/boxing; golf (2010 golf futures, golf tournaments, parlays and teasers); soccer (America, Europe, Asia-Africa, World tournaments, Euro 2010, UEFA Champions League, UEFA Europa Cup and World Cup 2010); tennis; autos (NASCAR futures, Indy racing, Formula 1, matchups and props, speed rows, parlay and teasers); football (NFL, arena football, NFL futures, NFL divisions, NCAA futures, parlays and teasers); 2010 World Cup and exotics (television, 2012 US election, preakness stakes 135, horse racing matchups, parlays and teasers). Customers are also able to enjoy a variety of instant casino games. These include multiple variations of blackjack, American roulette, European roulette, craps, baccarat, pai gow, sic bo, three card poker, Caribbean poker, casino hold’em, red dog and more.